The civil war between the militias of the Donetsk and Luhansk People’s Republics and the Ukrainian army has led to a mass exodus of inhabitants from the south-east of the country to Russia. Numerous inspections by Russian and European officials in the regions of Russia bordering Ukraine show that there are genuinely a large number of displaced people, but how many exactly no one has been able to count. The Russian government is using the issue of forcibly displaced people as an instrument in the information war – juggling statistics, officials attempt to show that the actions of the Kyiv authorities have lead to a humanitarian catastrophe. The active phase of the civil war in the South-East of Ukraine is already in its second month, and the issue of displaced people from Ukraine has been discussed in Russia for about as long. Every week, the Federal Migration Service (FMS) issues new statistics: how many Ukrainian citizens have entered the country, and how many inhabitants from the south-east of the neighbouring country have attempted to apply for residency in the Russian Federation. While at the start, the theme of refugees was discussed for the most part by the heads of the regions where the forcibly displaced had fled, for more than a month now the issue has been managed by the federal authorities. According to the FMS, at the end of July, about 144,000 citizens of Ukraine had already handed in documents to confirm their status as refugees in Russia. The majority of displaced people are staying in regions of Russia that border Ukraine, Rostov and Belgorod. In the Southern Federal District, more than 65 temporary accommodation centres have been set up, which contain more than 10,000 people. In the whole of Russia, they have made more than 270 temporary accommodation centres, where more than 26,000 people live. Those who are not staying in camps are staying either with relatives or friends in Russia or with inhabitants of the neighbouring regions, who have generously agreed to offer their housing for a period of time. Forcibly displaced people, as the officials note, try to stay in Russia using different legal formulations: apart from temporary asylum, they also receive the right to reside in the Russian Federation temporarily; and can submit forms to receive citizenship. The head of the FMS has said that more than 500,000 Ukrainian citizens have fled to Russia. The head of the FMS, Konstantin Romodanovsky, has said that, in the last three months since the start of the active phase of the so-called anti-terrorist operation in south-east Ukraine, more than 500,000 Ukrainian citizens have fled to Russia. Indeed, in order to increase the scale of the problem in the eyes of journalists, Russian officials frequently comment on the refugee situation, citing the statistics of Ukrainian citizens coming to Ukraine. For example, Valentina Matviyenko, Speaker of the Federation Council, announced back in June that over 500,000 Ukrainian refugees were already on Russian territory. Matviyenko called the situation of refugees nothing less than 'a humanitarian catastrophe.' The Investigative Committee back at the start of June went even further: its agents started a criminal investigation, ‘based on the fact of crimes against humanity in south-east Ukraine;’ and an investigative brigade was set up especially to look into the situation. Despite the unclear numbers of how many Ukrainian refugees there actually are in Russia, the authorities made short order of bringing in legislation that regulates the stay of forcibly displaced people in the country; and defines the process of giving out permission for temporary asylum. At the end of July, Prime Minister Dmitry Medvedev immediately signed several similar orders. In one of the most important, he simplified the procedure for Ukrainian citizens receiving temporary asylum. The Russian authorities made short order of bringing in legislation that regulates the stay of forcibly displaced people. Now, until the end of military action, displaced persons will be able to receive their right to stay in Russia over the course of three days, not three months, as it was previously. Medvedev's order proposes that temporary asylum will be presented on a group basis, which means that FMS agents do not need to study the individual information about an applicant; it is enough for asylum seekers to give their application to an FMS department, and simply state that they are fleeing military action in Ukraine. Until now, citizens of Ukraine could stay in Russia without documentation for up to 90 days, unless, that is, the head of the FMS, Konstantin Romodanovsky, ordered an automatic granting of residency. Aside from these amendments to the law, the Russian authorities are also spending record amounts of money on aid to refugees, and on establishing them in Russia. Dmitry Medvedev set aside an additional 780m roubles (£12.86m) for the FMS to carry out medical examinations of displaced persons, pay for their transport around the Russian Federation, and to pay benefits. In total, Russian authorities have set aside 5 billion roubles (£82.5m) in the last three months. In total, Russian authorities have set aside 5 billion roubles (£82.5m) in the last three months. In comparison, for the resettlement programme started in 2007 to resettle Russian-speaking compatriots, the importance of which has been iterated by President Vladimir Putin many times, the government spends 2 billion roubles (£33m) a year. Why 5 billion roubles were apportioned to the regions for settling refugees at a time when the exact number of displaced persons has not been established has not been explained, either by the government or the FMS. The money set aside by the government for Ukrainian refugees, will be distributed by the Ministry of Regional Development, the body responsible for working with regional authorities; and the lion’s share of government funds will go to the regions that border Ukraine. Anton Siluanov, Minister of Finance, noted that the funds will only be distributed for concrete aims, but how much the regions will receive and what they concretely need, he would not say. Neither is it known if the Audit Chamber will monitor the distribution of emergency funds. Human rights experts believe that temporary asylum needs to be offered to all Ukrainians who leave their country because of the war. 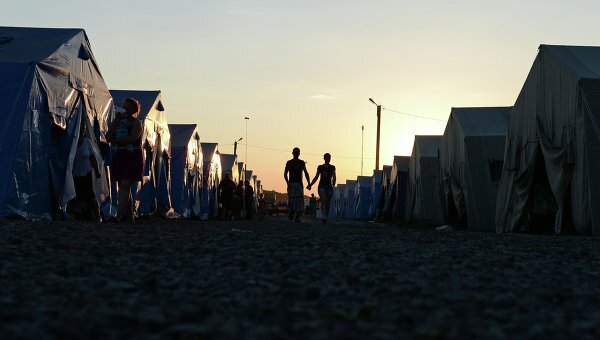 Human rights experts believe that temporary asylum needs to be offered to all citizens of Ukraine, who leave their country because of the war, because for as long as Russian officials have the choice not to offer asylum, it is quite possible that the explanations put forward by putative refugees will not be believed. So, just how many Ukrainian refugees are there in Russia? According to Svetlana Gannushkina, the figure of 500,000 mentioned by the Russian authorities is not worth taking seriously; most likely, she says, the FMS is counting all Ukrainians who crossed the border with Russia. The situation is further complicated by the fact that there is a visa-free travel regime between Russia and Ukraine, which makes defining the number who fled the war impossible. At the same time, however, Gannushkin admits that the flow of refugees into Ukraine is real. The Office of the UN High Commissioner for Human Rights has made no mention of 500,000 refugees coming from Ukraine into Russia. According to the latest data, 117,000 internally displaced people have fled the conflict in Ukraine to different regions of the country. In Russia, the High Commissioner confirms 168,000 people.